Welcome to our online store. We appreciate your visit and hope you enjoy shopping. We offer everything related to Pond and Watercourse, Fishkeeping and everything to preserve the health of your fin favorites. As a certified Trusted Shops trader we rely on full encryption of your customer data. 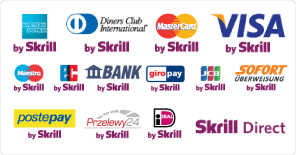 Through our payment providers Skrill Moneybookers and PayPal, you can purchase safely and easily by immediate remittance systems and credit card payment.